Congrats Brook! 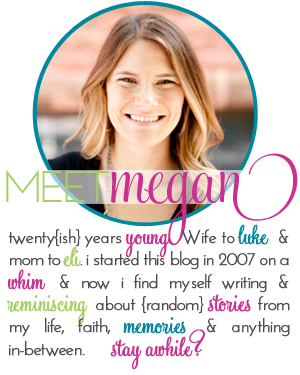 Contact me and I will get you setup with Minted! It's that time of the year again. Christmas Card time! I love receiving them in the mail and planning what our card will look like. This year I went the simple route and used pictures we had taken this past summer at the beach. I figured Eli hadn't grown too much since August and Luke and I look the same so might as well use those pics! I had an idea in mind of what I wanted so I texted my friend Sarah and told her to let me know when she was ready cause I was ready for her to design my card. I'm the bossy one in the friendship. She put together the perfect card for us! If you didn't receive a card from us this year consider this your card! Merry Christmas! Did you decide not to do Christmas cards this year, only to receive some in the mail from friends and family and regret that decision? Or are you running behind this year and have yet to purchase your cards? Or maybe you are planning on sending out New Years greetings and have not found the perfect card yet? 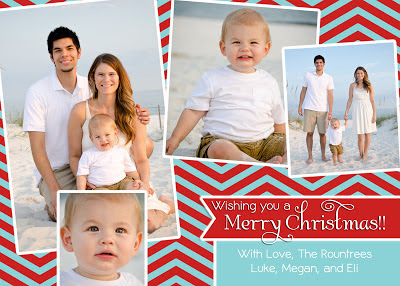 Minted has really pretty, very good quality cards with many, many options to choose from!! 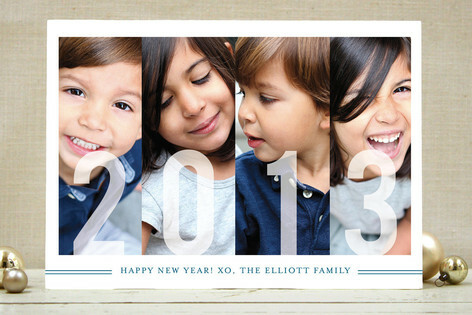 You can check out their holiday collection here: Minted Holiday Collection. 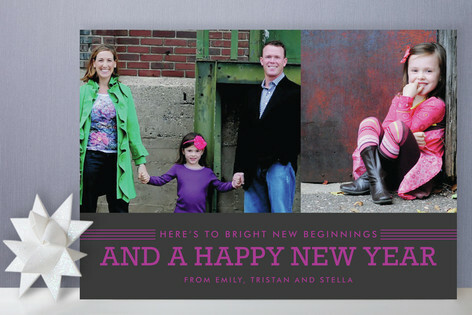 I am loving all their New Years card choice and kinda want to send out a New Years greeting now! Leave a comment below to be entered in for the $50. I will be choosing a winner SOON! For as long as I've been a member of my church (8+ years) I have served in our children's ministry. Throughout that time period I have worked with every age group - and I will admit that the babies are my least favorite group. It grosses me out enough to have my own baby's body fluids on me, but having the body fluids of another child who is not related to me in any way? It's almost too much to handle and my gag reflexes are worn out by the time church ends. After a couple of months in the baby room I immediately requested to be moved to children who can wipe their own body parts. More recently I have been teaching the smaller children who aren't yet in school, but can tell me if they need to use the restroom on their own. This is perfect for me. They don't talk back yet and they don't wipe their snot on me. Win. Win. I will admit there have been several Sunday mornings where I wake up and wish that I could sneak into church late, sit down in the back, sing some songs and leave, without serving, without caring, without reaching out. When I have these thoughts I recognize them as selfish and try and stop them. But there have been times where they have gotten the best of my attitude. This past Sunday was my week to serve and I was in my class teaching the lesson. As I read the story of Mary riding a donkey to Bethlehem to deliver the baby who was in her stomach I said "And do you know who the baby was?" While some exclaimed "JESUS" others said "A BABY", not every child in that class knew who Mary was carrying and that is completely normal. 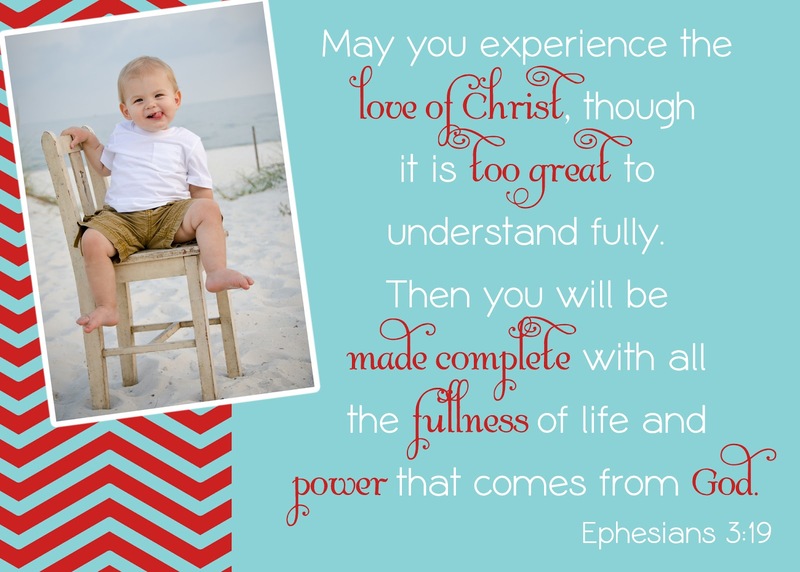 They are four and five year olds, fresh lives, soaking in everything around them like a sponge. So I explained to them that she was carrying Jesus who is a gift to us. The best gift ever. And somewhere between asking them to stop talking, to please pay attention, sit still, stop touching your neighbor, get your hands out of your nose, don't eat your glue etc. It hit me that these children, were just a little bit younger than the 20 children that were tragically killed on Friday. I looked at these kids and for about the 18th time that weekend started tearing up. They didn't notice because they were too busy playing, or coloring or bothering the kid next to them, but I looked at them and thought of the children who were doing all of the above when their life ended because of the decision of someone else. While it made me sick to think about, it also changed my outlook in what I do every Sunday. Why do I get so worn out teaching a children's class for ONE HOUR EVERY OTHER WEEK? Why is it so exhausting to me? Because it interrupts my week? Because of what I would rather be doing? For one hour I am given the opportunity to pour into the lives of children. I am able to TEACH them who Jesus is, I am able to tell them the Christmas story, and the story of the Good Samaritan and all the other true stories that so many of us grow up with. Why do I see this as a burden when I should see it as an opportunity? These aren't just children, these are lives. Human beings who will hopefully grow up and live a full life and help others. And I have a chance to be yet a small/tiny part of their life to teach them something that will hopefully become a huge part of their life and who they are. While those 20 little lives ending is absolutely awful and unfathomable it has shown me once again how precious life is and how each and every single life matters. Even when it seems that they aren't listening or they are bored or they are just a naughty child who doesn't care, it matters. They matter. He matters. She matters. I always say I want to be a light for Jesus to every person I meet and when I say that I tend to picture my peers, people I encounter in the grocery store or a new guest at church or my friends. Not so often do I realize that being a light includes every age group - even the little children who seem to slip under my radar often. Even though it seems that they have the whole rest of their life to grow up and hear the gospel, God-forbid they may not, and I have been given the opportunity, THIS MOMENT to share with them what has changed my life. And now, instead of feeling burdened by my task of teaching a class every other week I am going to see it as an opportunity. To share the light I try to live by everyday. To the little children of this world. 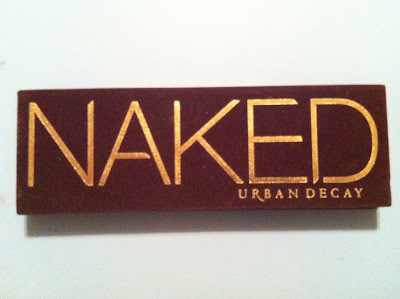 Remember when I blogged about needing to try new makeup, like 18 years ago? Well now it's time to do my first update. The original post is here. I'm sure you've been checking back with anticipation every single day. Well you can calm yourself because the day has come to update you in my makeup journey. 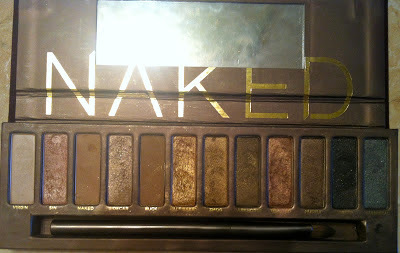 First of all it comes with a pretty hefty price for eye shadow in my opinion. But after using it I can say that it is truly worth it. It lasts so long and just blends together so nicely. If you need help in applying eye shadow there are lots of tutorials on youtube. I watched one and then ended up not even applying my eyeshadow how the video said to do it so it seemed pointless for me to watch it. I can tell these eye shadows are going to last a long time. I'm definitely excited about this purchase and I'm not even lying when I tell you I get compliment on my eyeshadow all the time. I've NEVER gotten compliments on my eyeshadow before! 2. Next I branched out from my Clinique foundation that I have used FOREVER and tried Hello Flawless by Benefit. I'm sort of eh about this. Maybe it's because I'm used to the same foundation for over 10 years but I'm just not loving this as much as I do my Clinique foundation. It is sort of watery and I don't feel like it lasts any longer than my previous foundation did. But I am determined to use this whole bottle. Money doesn't grow on trees around here. And I don't HATE it, I am just anxious to try something else. 3. Since I've been using the same mascara since I first started wearing mascara (much too late in life) I decided I needed to find something new. 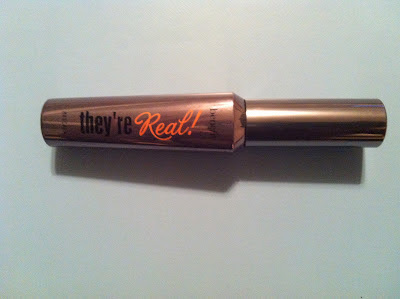 I did a twitter survey trying to figure out what mascara I should try and "They're Real" by benefit won by a landslide, people swear by this stuff. I have very short and thin eyelashes, basically the worst combination when it comes to eyelashes. This mascara did help me and I liked it a lot, the only thing I didn't like about it was it is SUCH A PAIN to get off. I would use eye makeup remover, do all the proper "eye makeup remover" protocol and it would still be on my eyes. And then when I woke up in the morning it was not a pretty sight. That is probably the only downside to this mascara. Other than that is great and made my eyelashes much more full. On to the next 3 products. Hopefully it won't take me a year to review them next time! 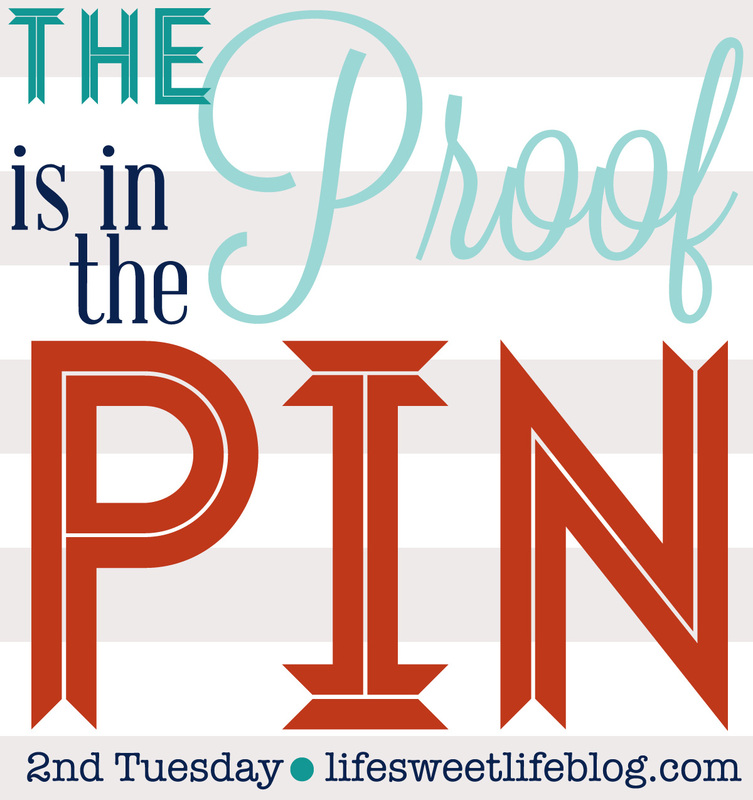 I have wanted to participate in Sarah's "The Proof is in the Pin" link up for awhile now, but I haven't recreated any pins in a LONG time, but this week I finally did something that is pin-worth. 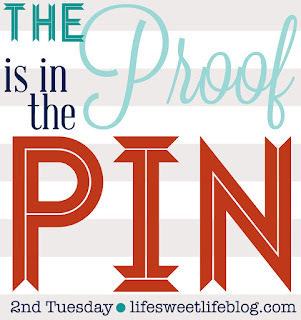 Because I'm always incredibly long winded I need to tell the back-story of my pin. I absolutely love tomato soup - not that yucky Campbell's tomato soup stuff but a good thick basily tomato soup. I even blogged about my love for tomato soup somewhere on this blog, but I don't feel like going back through my archives and finding it. Knock yourself out. Anyways, I love a good tomato soup but they always seem way too involved for me. 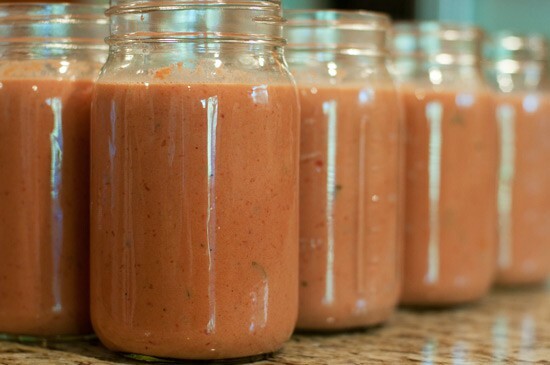 If a food takes too much work in the kitchen it quickly loses my interest. No matter how good it tastes. Well one night I was at my friend Ashley's house and she had prepared the most delicious tomato soup ever. It was perfect consistency, perfect amount of basil and perfect taste. I was in tomato heaven. I couldn't believe it when she told me that it was from pinterest. So I looked it up and made it that weekend. And Luke loved it also! It has since become a favorite in our house. The pin is Tomato Basil Soup and GO MAKE IT RIGHT NOW. Ashley added cheese tortellini to hers so of course I did the same and it is SOOO good and makes it more filling. "Experience is not what happens to you; it's what you do with what happens to you"
Actually I didn't once hear that, I just googled "wisdom quote" to try and find something for this post and it was the first one that came up. And really, the wisdom that I'm going to share with you involved how to get on a pair of tight boots, so maybe I should have googled a quote about being materialistic? SO anyways let's get to the materialistic wisdom. After several months of lusting over a pair of boots (clearly not exhibiting one of the fruits of the spirit here) I finally decided to splurge and get a pair. I actually found them on a site that sells them for a bit less than how much they normally retail for, the only problem is that once they are sold out that's it, you can't get that size again. So when ordering I knew I needed to get it right the first time cause there was no going back, Jack (I've been watching too much Duck Dynasty). I waited not so patiently for the boots to arrive at my front door and low and behold one day they arrived and I might have squealed. Maybe. Probably. I ripped open the box and sniffed that amazing leather (again, not proud of my lust here) and immediately fell in love. I put on a pair of my socks and attempted to put on the boots. ATTEMPTED being the key word here. The left boot wouldn't budge. I would get my foot in but when I tried to move past the ankle area it wouldn't give. At all. I called the company where I got the boots and they informed me they were all out of my size and I would have to just get my money back. Um. no. Not an option. My foot was going to go into those boots even if I had to drink some magical foot shrinking potions. I did a little research and found that if you put a plastic bag over your sock it helps your foot slide in. I tried it and my foot slide in like butter. Well butter going through a grinder, but still much better than before. And once my foot was in I ripped the bag off. It was the perfect solution! Now every time I put my left boot on I have to make sure I have a plastic bag handy to put over my sock. I also make sure Luke isn't around because he rolls his eyes every single time and tells me that I'm crazy, which I reply: no, I'm a GENIUS. Now this is where you need to pay close attention. Not all plastic bags are made alike. For awhile I was using a Target bag and while it helped my foot slide in was hard to tear the bag away once in the boot. The best bags I have found are very thin bags, think: Dollar Tree, Hobby Lobby and TJ Maxx. Even Wal-Mart bags work great even though they are a bit thicker than those others, they are still thinner than Target. I bet your mind is blown. You had no idea there were so many plastic bag consistencies! Stick with me. I am a wealth of knowledge. However when it comes to getting them off I am no help. Luke has to take them off. One time I wore them when I wasn't around Luke and I had to wait for him to get home from work to take them off. True story. Beauty is pain. Or maybe materialism is pain? Either way I hope my learned wisdom helped you in some way. 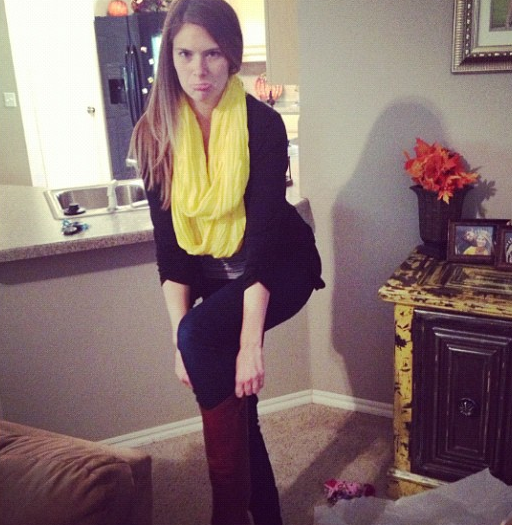 Maybe you just learned not to pay a dumb amount of money for a pair of boots you've never tried on. Unless you have a magic plastic bag. A couple of weeks ago Eli and I were in the grocery store and they had one of those giant inflatable Santas all blown up and waving around. As we walked by it Eli exclaimed "SANTAAAA" which took me by COMPLETE surprise. Luke and I have never talked about Santa to him, not by any purposeful reason but Santa doesn't really come up in conversation January-November. I had no idea how he even knew who Santa was, and Luke didn't believe me that he really said it. So that night we went through about 20 minutes of showing Eli pictures of Santa and saying hey Eli who is this? And he would scream SANTA. It was pure vindication for me. I didn't just imagine that Eli had said Santa and I was able to prove it to Luke! Well over the days Eli would not only say Santa but he started saying "ho, ho". Yes Santa typically says "ho, ho, ho" but Eli leaves off the 3rd Ho. It is very frustrating for an OCD person such as myself but no matter how many times I worked with Eli on it he still only gives me two ho's. The fact that Eli knew who Santa was made this season that much more fun. He loves our Santa figurines around the house and his picture with Santa from last year so I've been talking it up, in anticipation of our 2012 Great Santa Visit. Which occurred today. It was going to be awesome. I would say "You get to sit on Santa's lap today!!" to which Eli would say "HO HO" it seemed absolutely perfect. We made our way to the mall and took our place in line. We would point at Santa and Eli would smile at him. I knew this was going to go so well. And I feel like I need to tell a side-story here. Last year we went to the Santa at our local mall and much to my surprise and unhappiness he didn't have on the regular Santa suit - he had on his "workshop" outfit. Also known as kind of a "rip off". But because I'm a sucker for traditions I decided to go visit the Santa suit-less Santa so that our displayed framed Santa pics would have matching Santas. Priorities. As we waited in line we approached a tree where Eli and I took a picture last year. I thought it would be perfect to recreate the moment. 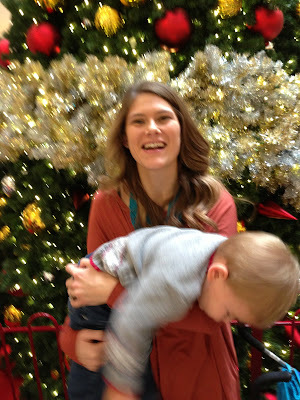 Despite our terrible attempt at a mommy/son beautiful moment captured on camera I still held out hope that Eli's encounter with Santa would be magical. 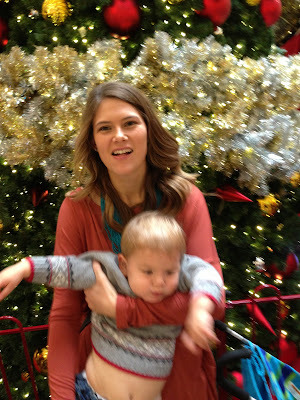 We kept getting closer to Santa and Eli kept trying to run to Santa. PERFECTION. Then it was our turn. Eli started walking to Santa holding my hand while Santa looked on with his arms wide open (which would be creepy on any other given day). The closer we got the slower Eli walked. Till he basically stood there looking at Santa with a look on his face that can only be explained as "oh crap I have to actually sit on that man's lap?" This is where I win the best mom of the year award. I threw Eli on Santa's lap took off running and told the camera guy to snap the picture. We had already paid our RIDICULOUS fee so we were getting a picture. Perfect smile or not. So here is Eli with his "Ho Ho"
Please note Santa's death grip around Eli. Also, after today Luke and I had a conversation we've never had before. We debated whether we thought Santa's across America wear "protective cups". As soon as I grabbed Eli he was fine and gave Santa a chipper goodbye. It was a fun morning and one we will definitely remember! Sunday mornings in our house are always an interesting time. I try to get Eli and myself ready for church and to be there on time, which really doesn't sound that hard, but as Eli gets older and more active it gets a bit harder. Most mornings by the time we leave our house it is a complete PIT because he has gotten into everything keeping himself entertained while I primp myself. And maybe I don't need to primp myself but lately it's been the ONLY DAY that I put on makeup so I like to make sure I look goooood. Anyways, a couple of weeks ago I was getting ready when I realized Eli was running around chanting. I started watching him and realized he wasn't quitting or slowing down anytime soon. So I started filming him because it made me laugh and I knew it would make Luke laugh. 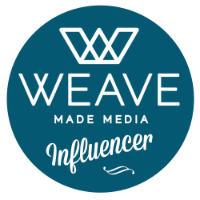 Because I haven't blogged in a couple of days and I'm currently running on EMPTY when it comes to anything even half way worthy of blogging I decided to share this video because maybe it will make you laugh! 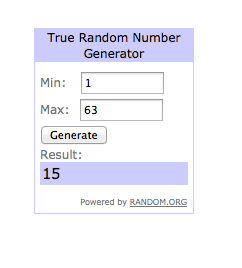 A New Month and Giveaway Winner! 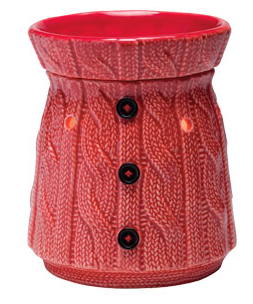 It's time to reveal the December Warmer of the Month!! This month it is this warmer which is appropriately named "Comfy Cozy"
I can just see this warmer being used at an "Ugliest Christmas Sweater" party or something like that! It is definitely an original piece - I've never seen anything like it! It is described as an "unexpected winter berry patch" with tart ruby cranberries and sweet purple huckleberries dusted with silver sage! And don't worry you still have time to get in orders just in time for Christmas! You have until December 18th to ensure that your order will be shipped before Christmas! 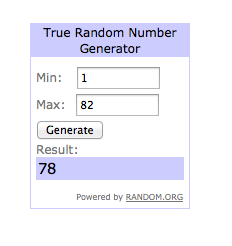 And now the Weathered Ways giveaway winner! Katie! You are the winner! Please email me and I will get you in touch with the owners of Weathered Ways to get your personalized sign started! Congratulations!